From the section of hair that is hanging down, separate a strip that is approximately two or three centimetres wide. Clamp the iron to this strip near the roots, and gently and smoothly pull the iron down toward the tips. Repeat this process across the entire section. 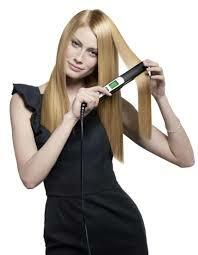 Individuals should find a heat level that works best for their hair. In general, delicate hair responds better to multiple, quick passes with a low heat setting, while thick, curly hair can be handled with slow, single strokes on a high heat setting. Be aware that high heat can be damaging to hair if left in a single place for too long, while multiple passes wear hair out. Ultimately, personal preference and comfort levels should dictate the process, so find an efficient balance that provides the best results while retaining healthy hair.